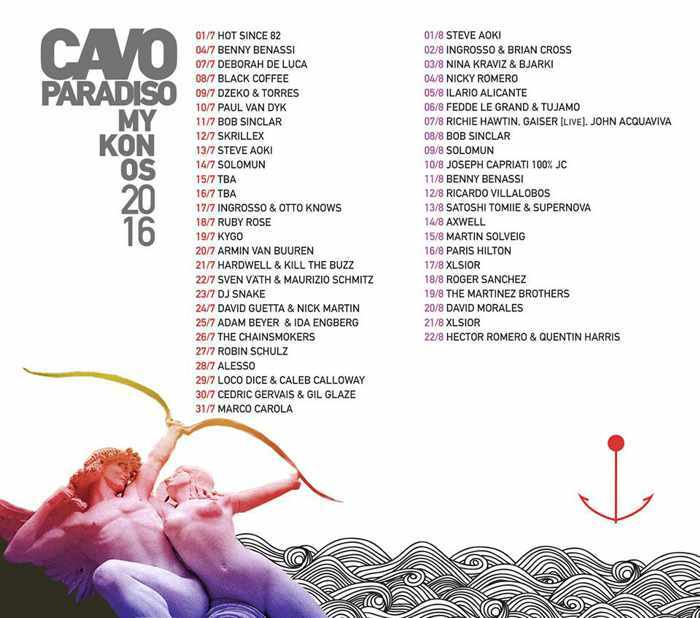 … and this is Cavo Paradiso’s international DJ lineup for July and August. Curiously, the club did not release a full schedule of events for June. 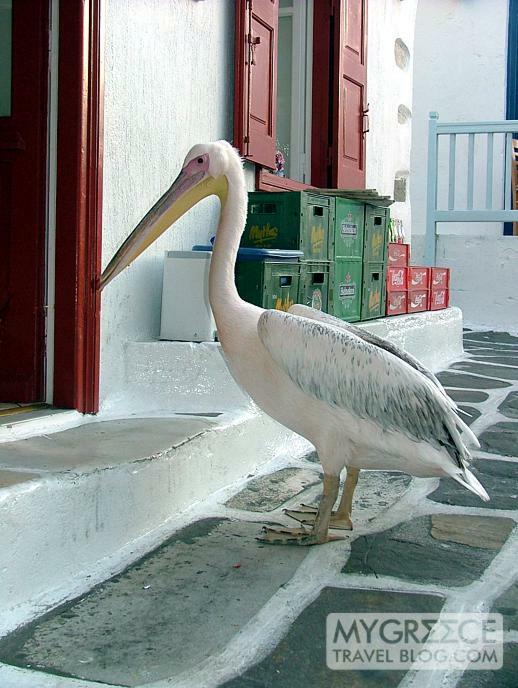 What’s happening: Now that it is spring, some Mykonos bars and clubs have opened for the 2016 tourist season, while others have begun announcing the dates they will re-open. 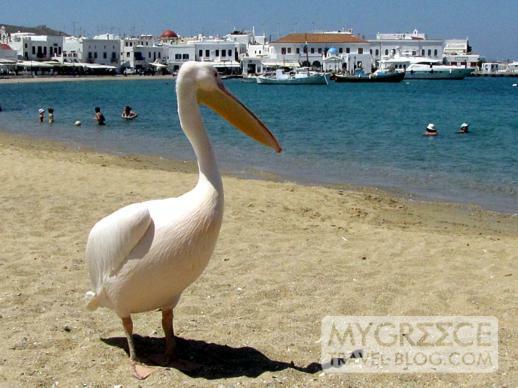 Ling Ling got things off to an early start on March 23 when it kicked off its second season on Mykonos. It was followed in early April by Passo Doble Cocktail Bar, the JackieO’ bar in Mykonos Town, and Room 101. Mid-April saw the opening of popular gay hangouts Lola and Porta Bar, along with Galleraki Bar and Vicolo Bar at Little Venice. Scarpa Bar and Semeli Bar in Little Venice will open in late April, as will Thalami Bar behind the Mykonos Town Hall, and Remezzo near the Old Port. Beach parties resumed in mid-April with Guapaloca Bar and Tropicana Club opening at Paradise Beach. 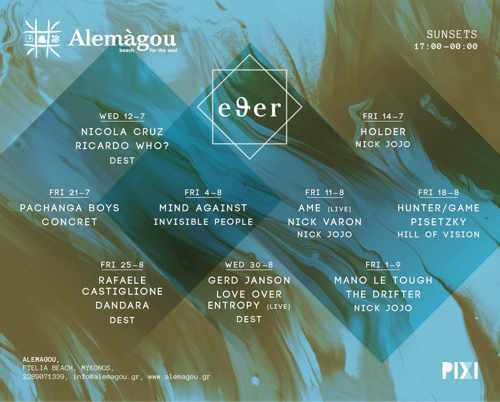 They will be joined the last week of April by Nammos at Psarou beach and Kalua Bar at Paraga. And in May, Scorpios will celebrate its grand re-opening at Paraga beach. Speaking of beach clubs, there will be at least two new spots to check out this summer. 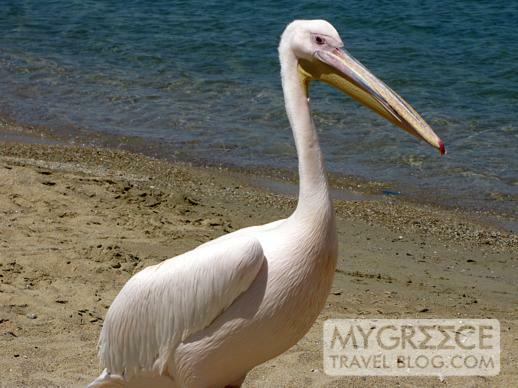 Rakkan Mykonos will be opening in late May at Kalo Livadi beach, while Monarch has moved to Platis Gialos beach. 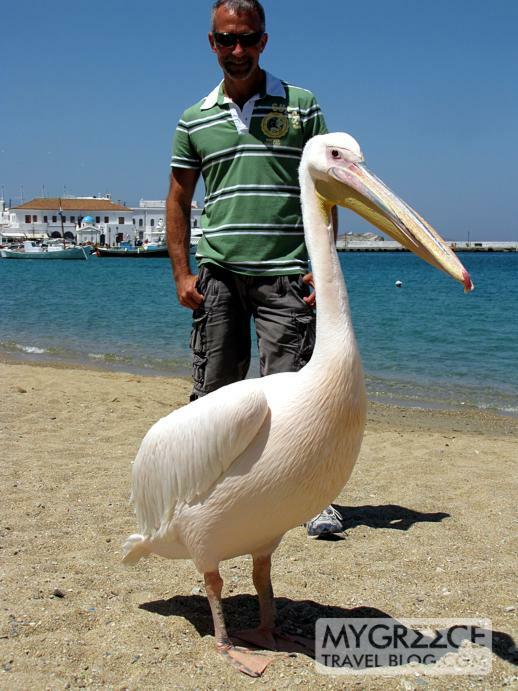 See my post New beach bar/restaurant venues coming to Mykonos for further details about those two places. Click here to see club openings and events scheduled for May. Click here to see announcements for parties taking place in June. 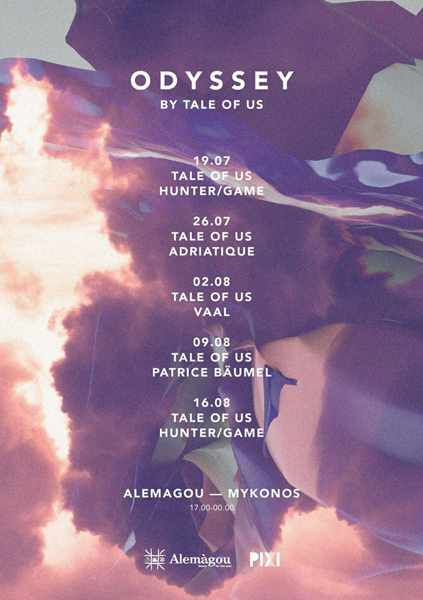 Click here to see parties and events that have been announced for July. Click here for a list of events being held in August. Click here for parties taking place in September and October. 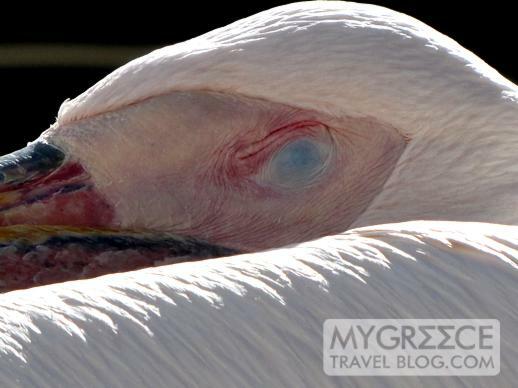 And click here to see where you can find live jazz, rock, Greek and other music shows on Mykonos. Bookmark this page and keep checking back — I will be updating this post with information about bar & club openings, and DJ schedules, as soon as events are announced. Keep in mind that the island’s biggest party clubs generally don’t post detailed summer party lineups until late May to mid June, while many bars don’t publicize their season kick-off celebrations until shortly before they open their doors. 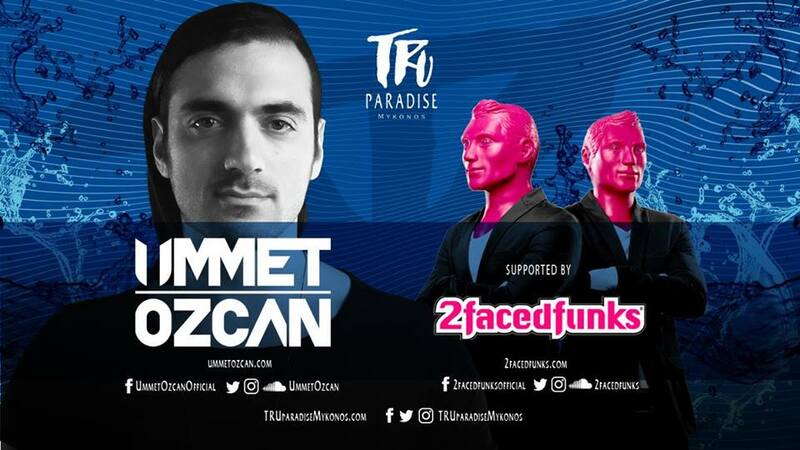 For information about ticket prices, advance booking, table reservations and VIP services, please contact the specific clubs you are interested in. 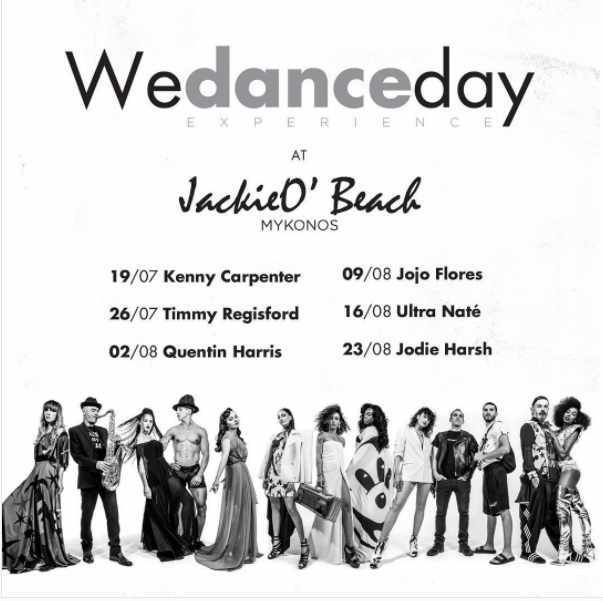 And if you want to get a general idea of what to expect around the time you’re planning to visit Mykonos this summer, scroll through my 2015 party post, which lists club openings and party events that took place each month between March and November last year. 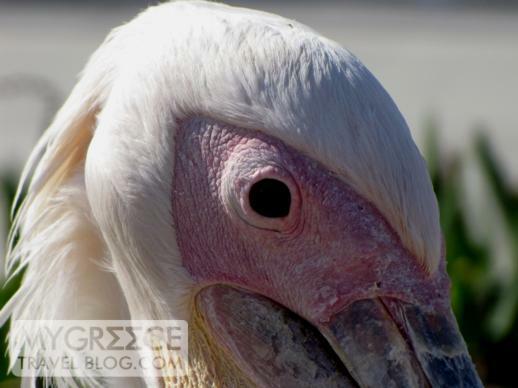 Two great articles about Cavo Paradiso have been published this winter. 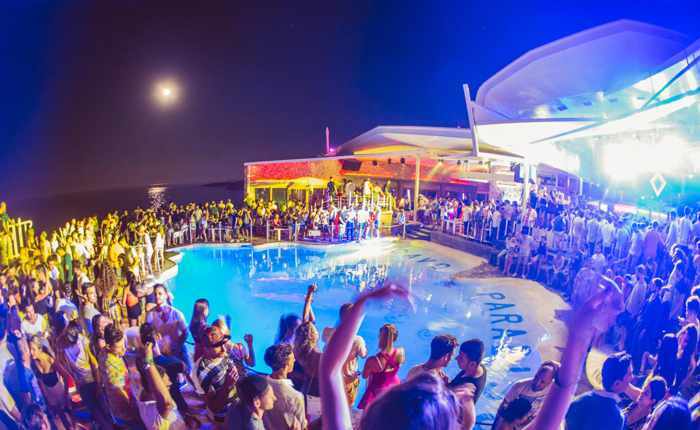 Have a look at ClubWorld’s Mediterranean Clubbing Mecca, and Thump’s How clubbing has provided a refuge during Greece’s economic hardships. 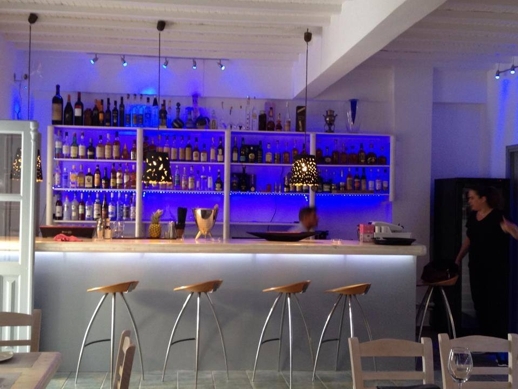 The bar at Funky Kitchen Mykonos, a new restaurant that opened recently in the Lakka district of Mykonos Town. The photo is one of several posted recently on Funky Kitchen’s Facebook page. 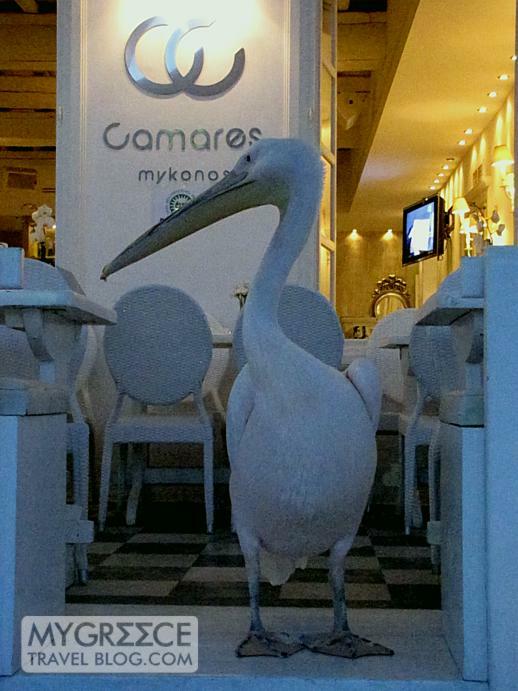 More openings: Several weeks back I posted photos and information about brand-new tourist-related businesses opening on Mykonos for the summer of 2014 (see my April 13 2014 report headlined: Remezzo club gets restyled into restaurant & bar as new places to eat, stay & play open on Mykonos). 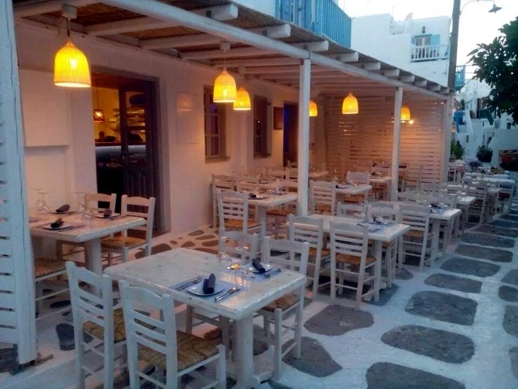 Friends on Mykonos tell me the arrival of the new accommodation, bar and dining venues has heightened the positive energy and enthusiastic buzz that has been steadily building this spring as travel bookings indicate the island could see a whopping 40% increase in visitor numbers this year. That excitement will continue to increase this week, and throughout May, as more of the island’s already-established restaurants and bars launch their season with opening parties and special events. 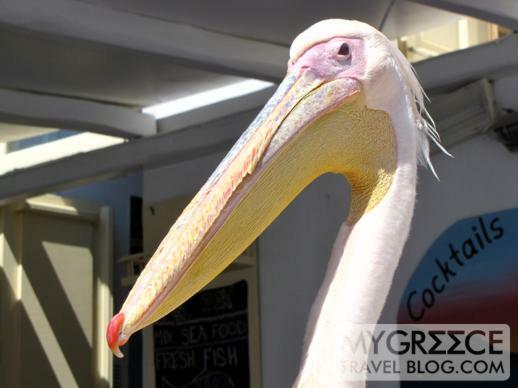 Located near the busy Fabrika bus depot, the area around Lakka Square in Mykonos Town has long been one of the island’s top destinations for drinking and dining. It’s home to a variety of hugely popular restaurants and tavernas, including Bakalo, Marco Polo Taverna, Mediterraneo, and Sale e Pepe, and is where the cavernous Space Mykonos nightclub was located. This year has brought three noteworthy changes to Lakka’s vibrant restaurant and bar scene. Space is gone, and a new venue — Dream City (DC) — has taken its place. DC kicked off the season on April 19 with a grand opening party featuring Melisses and Knockout, and threw another bash the next day with Claydee and Bang La Decks. During May, Dream City will be open only on Fridays and Saturdays, but after that will be party central every day for the rest of the summer. Just around the corner from DC, Funky Kitchen has opened its doors and begun welcoming customers. The restaurant subscribes to the “slow food” philosophy in preparing its Mediterranean dishes from high-quality, locally-sourced products. Everything the restaurant serves is made in-house, from its bread and dips to its marmelade and sauces as well as its sweets, chocolate chili and cardamom ice cream. Funky Kitchen also boasts an extensive wine list and cocktail menu. 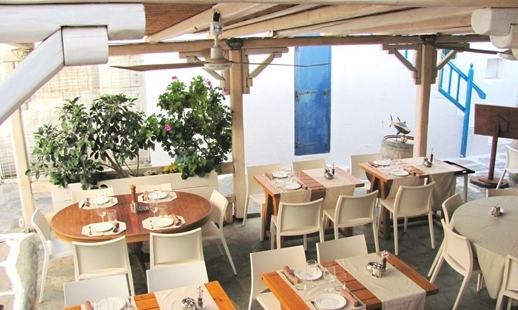 Funky Kitchen is situated at 40 Ignatiou Basoula street, next door to Marco Polo Taverna. The third newcomer to Lakka Square is Noodle Mykonos, an Asian “fusion” restaurant with a noodle and sushi bar. Noodle offers “quick, fresh and healthy” cuisine for on-site dining, take-out and delivery. 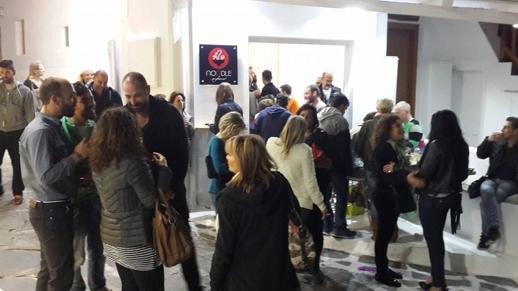 This photo of guests gathered outside Noodle Mykonos during the restaurant’s recent opening party was posted on Facebook. 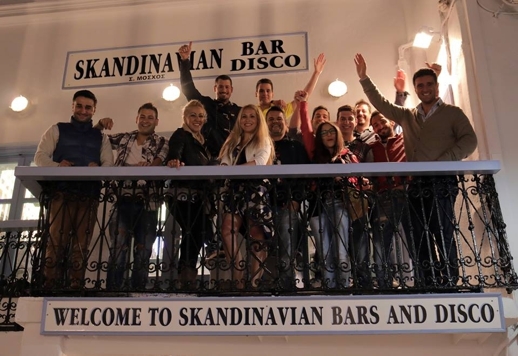 The Skandinavian Bar and Disco has been a veritable institution on Mykonos since 1978, ranking as one of the top places to party in the Greek islands every year since then. Its opening night event for 2014 takes place tonight (May 5), and the place will continue rocking all summer long. Also opening today is another popular bar that has developed a legion of fans and regular visitors from around the world since it opened in 1976 — Kastro Bar. It’s located steps from the famous Paraportiani Church and boasts great sea and sunset views. This photo of the Kastro Bar interior was posted on the Mykonos Facebook page today to announce today’s official opening. 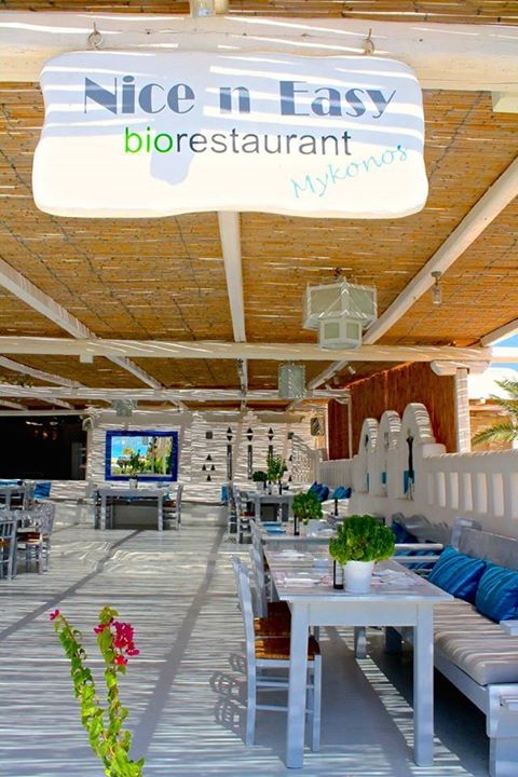 The Nice n Easy Bio restaurant cafe expanded from Athens to Mykonos last summer, and the island outpost became an instant hit. Nice n Easy Mykonos vaulted to the #37 ranking for Mykonos restaurants on TripAdvisor.com, supplanting Solymar as the trendiest eatery at Kalo Livadi beach. 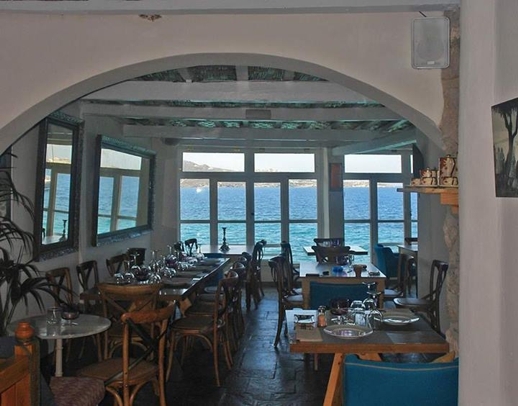 (Solymar had to settle for the #176 ranking on TripAdvisor’s Mykonos restaurant chart). Will Nice n Easy duplicate its success in 2014? We may soon find out — it will be opening its doors on May 16. 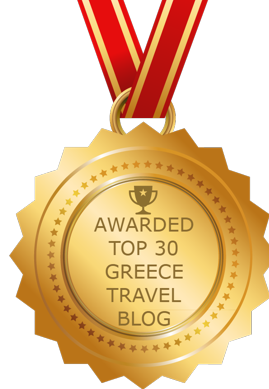 Kalosta Restaurant quickly became one of the most popular new places to dine on Mykonos last year, vaulting into a high position on the TripAdvisor.com traveller reviews (where it is currently is rated as the #12 restaurant on the island.) It opened for a fresh season on May 7. 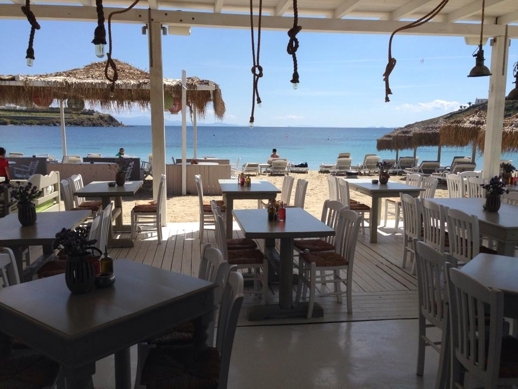 It joins several perennially-popular dining spots that have already opened for business at other beach areas, including Kiki’s Taverna at Agios Sostis, Aneplora at Kalafatis, Solymar at Kalo Livadi, Tasos at Paraga, Nammos at Psarou, Kostantis at Ornos and Hippie Fish at Agios Ioannis. 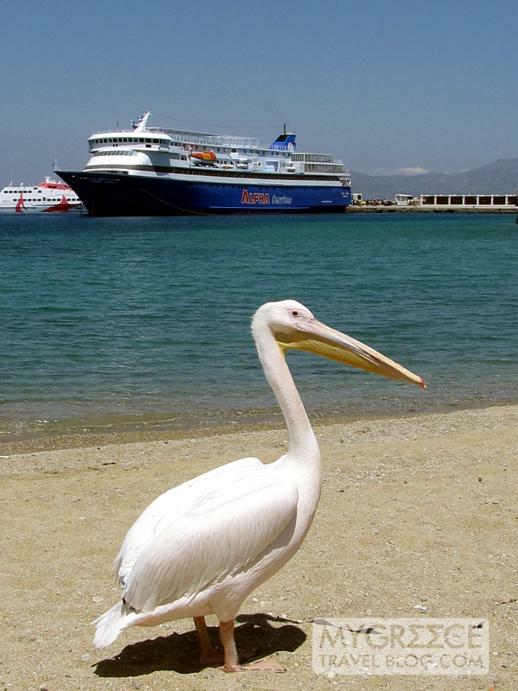 Launching its season soon will be Fokos Taverna at Fokos beach, which has set its opening for May 15. 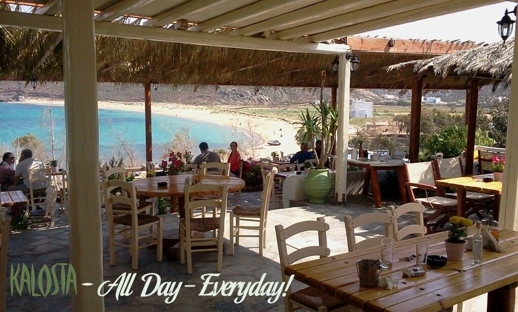 Kostantis restaurant is situated near the middle of Ornos beach. This photo of the beachside dining terrace appears on the Kostantis Restaurant Facebook page. Fans of superb Italian food and fine wine will be happy to hear that Sale e Pepe is open for another season. 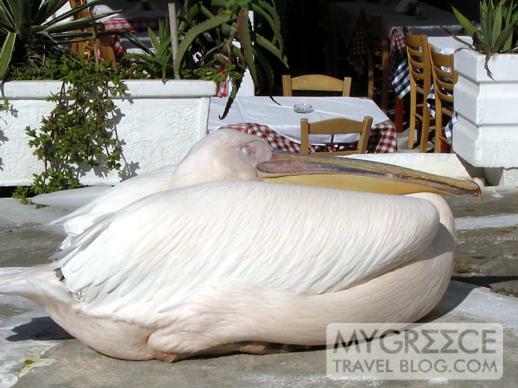 The restaurant is located at Lakka Square and has won numerous accolades for its food and wine. It has been well-known for its wine list which is arguably the best on the island, and which has won acclaim from Wine Spectator magazine as one of the best restaurant wine lists in the world. Lovers of authentic Neapolitan pizza will be delighted that Marechiaro is now open again, too. Besides pizza, Marechiaro offers salads and appetizers as well as fish specials and rib eye steaks. 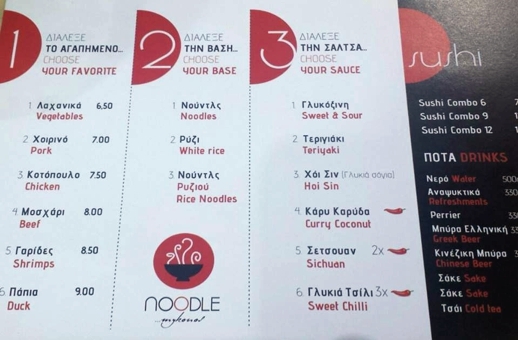 Pizza can be ordered for pick-up and take-away each day from 7 p.m. to 1 a.m.
Last but not least, the world-famous Nobu Matsuhisa Mykonos started its second decade of business on May 9. Situated in the chic Belvedere Hotel, the restaurant celebrated its 10th anniversary last year. Boogie nights return to Taxi Square on May 16 when the new lounge & discotheque @54 Club opens in the premises formerly occupied by the Ramrod Club gay bar. The grand opening celebration starts at 7 pm. Bartender Tassos stands outside @54 Club, a new disco & lounge opening on the premises once occupied by the Ramrod Club gay bar. The club, located next to Taxi Square in Mykonos Town, starts its boogie nights with a grand opening party on May 16. The photo is from @54 Club’s Facebook page. Roca Cookery isn’t a new restaurant (it has been in business for nearly three years now), but I noticed they have added something new that will probably be as huge a hit with tourists as their excellent seafood dishes and Greek cuisine. One evening each week, Roca Cookery will host a Greek dancing show with live music. 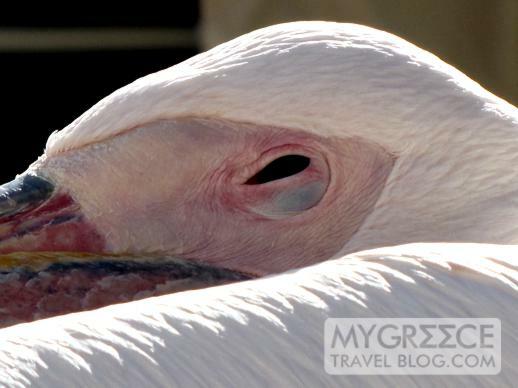 The spectacles will take place on Tuesdays at 21:30 (9:30 p.m.). For reservation inquiries, contact the restaurant by telephone at 30 2289 022955 or drop by in person. 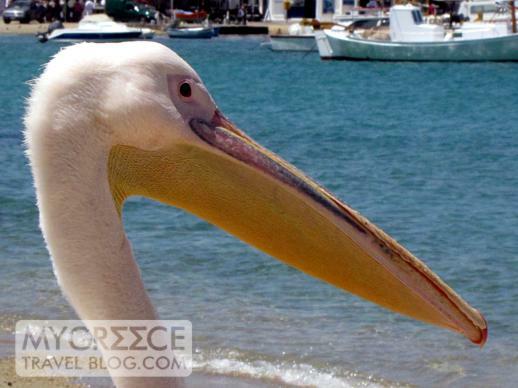 Roca Cookery is situated next to the Mykonos Archaeological Museum on the road above the Mykonos Old Port. 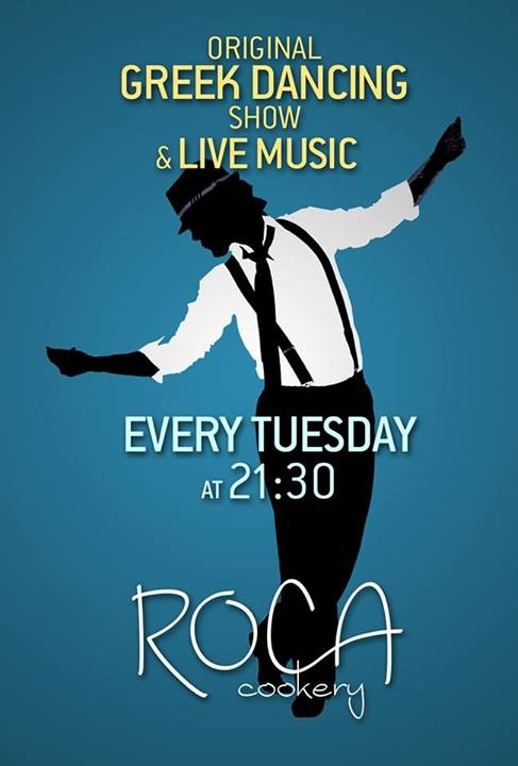 A promotional image for the new Greek dancing and live music shows being held every Tuesday night at Roca Cookery. 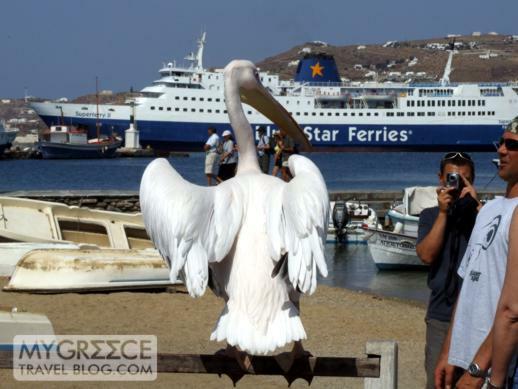 Famous feathers: Mention Mykonos, and most people instantly think of windmills, sandy beaches and white cube-shaped houses with blue shutters and doors. 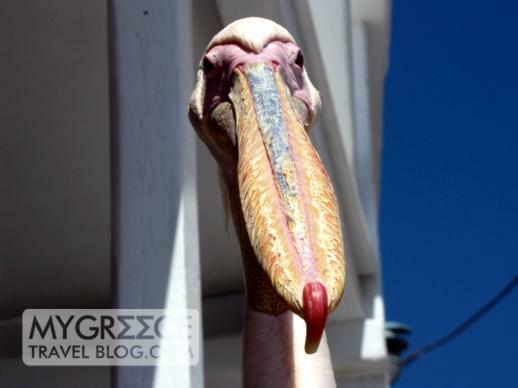 Yet one of the most popular tourist attractions on the island is a bird — a 53-year-old pelican named Petros. 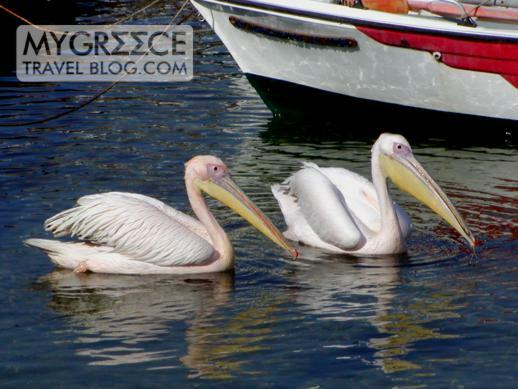 Actually, there’s not just one pelican on Mykonos — there’s a pod of three. And even though they all seem to be called Petros, they aren’t in their 50s.Yet. 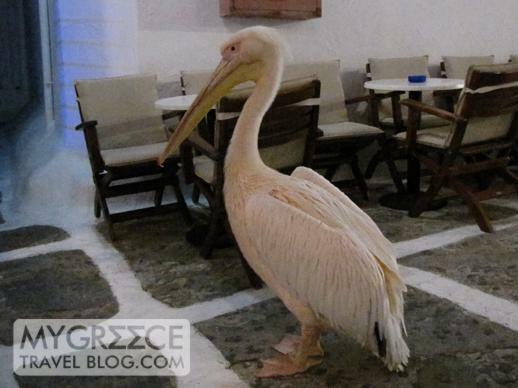 According to local legend, the original Petros apparently flew from mainland Greece to Mykonos during a fierce storm. 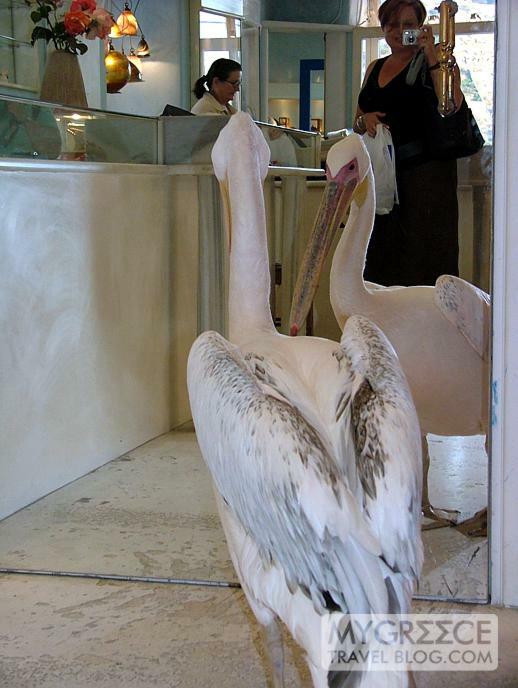 He was found, half-dead, by a fisherman who nursed him back to health. 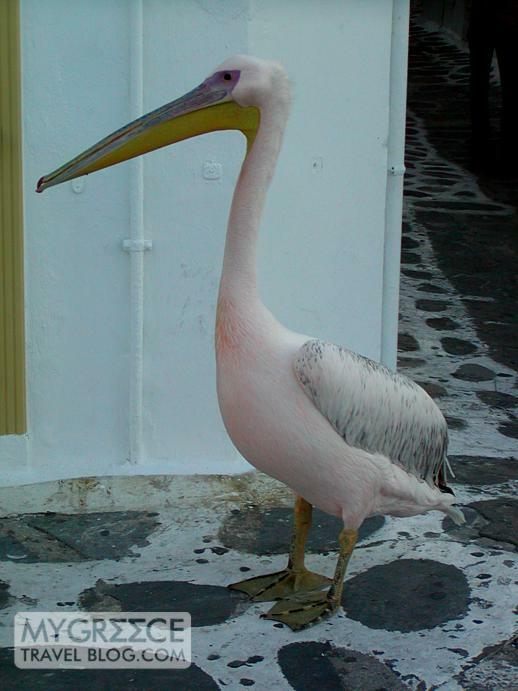 Island residents named him Petros and took turns feeding him. 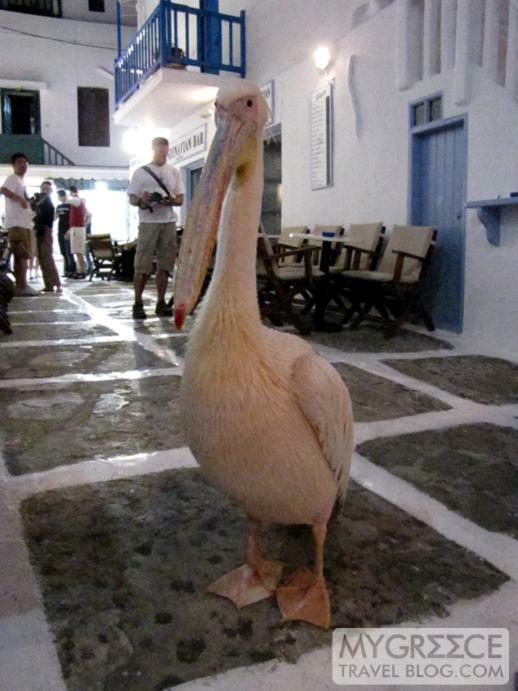 Petros became such a hit with tourists that he was designated as the official mascot of Mykonos. But he met an untimely, scandalous demise around 1986 when he was either run over by a car (some locals blame a drunk taxi driver) or sexually assaulted (some blame a drunk tourist). 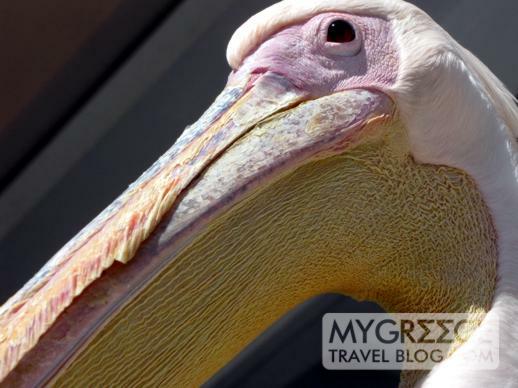 Another legend maintains that jet setter and regular Mykonos socialite Jackie Onassis gave the island a new pelican to replace its maimed mascot, while another says a German zoo donated a bird as well. 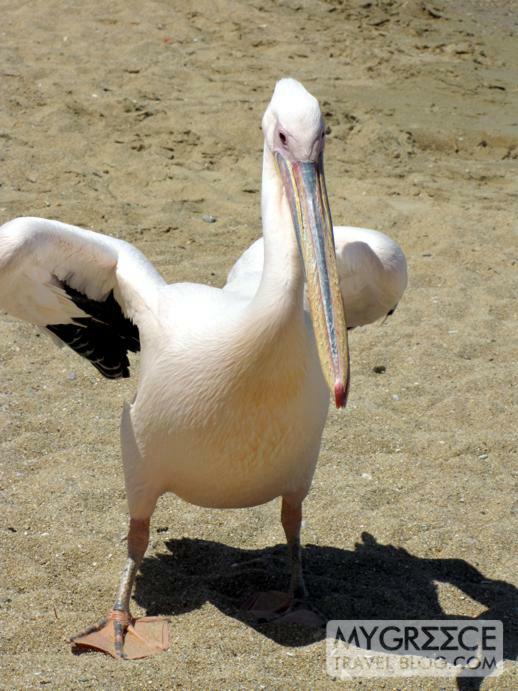 Yet another story says a third pelican wound up on Mykonos when he was discovered on a beach, injured like the original Petros, and brought back to good health by the locals. 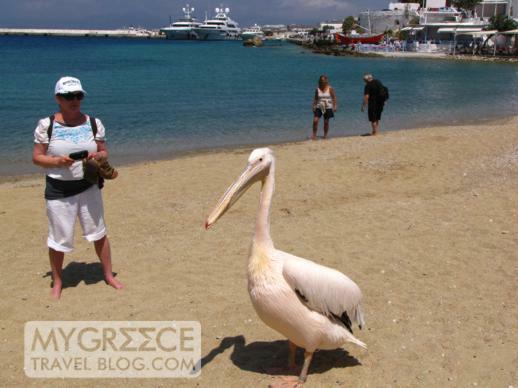 Whatever one or all of the stories is true, it’s a fact there’s at least three pelicans entertaining tourists on Mykonos these days. They can often be spotted as a group, in a pair, or sleeping or strolling around solo. 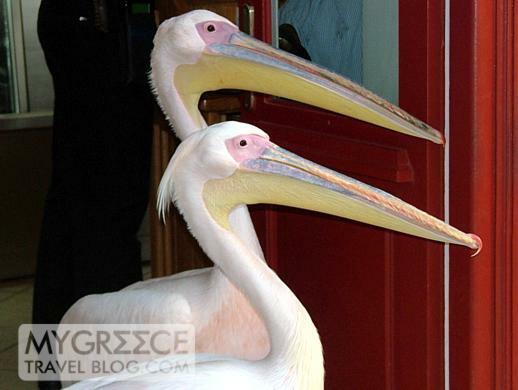 Their favourite places to hang out are at Niko’s Taverna (where they pose for photos with diners and then collect fresh fish treats from the kitchen), Paraportiani Square, Little Venice, the windmills on the hillside above Little Venice, and along the Mykonos Town harbourfront. 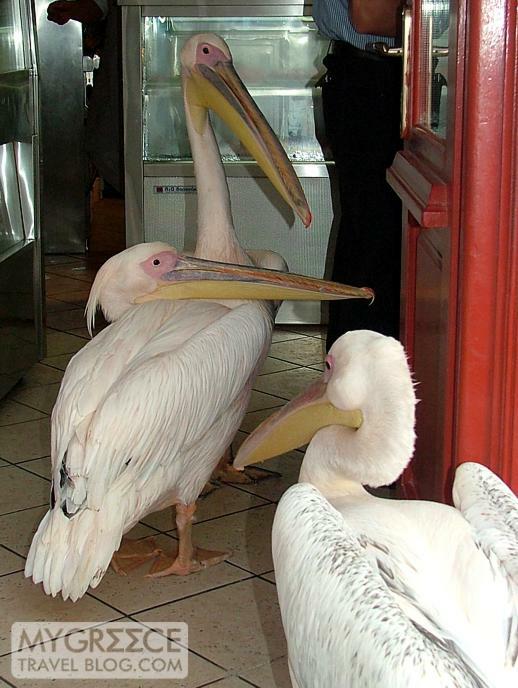 The last two times we’ve been to Mykonos, we’ve encountered pelicans in cocktail bars at Little Venice and on the harbourfront. Which makes me wonder … haven’t they been warned that it’s dangerous for them to hang around people drinking booze? 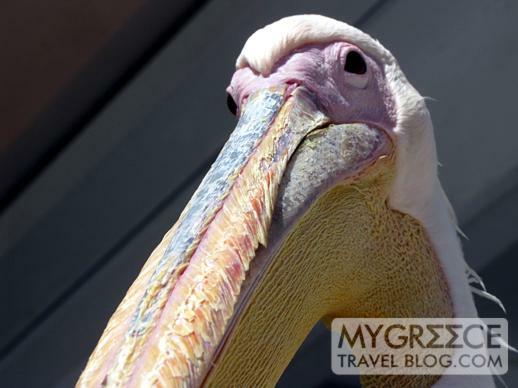 Below are photos of some of the pelicans we’ve met during some of our visits to Mykonos. Waiting for someone to buy him a beer, perhaps?